NOVEMBER/DECEMBER 2017 | www.broadbandcommunities.com | BROADBAND COMMUNITIES | 33 technical skills, employer-specified skill sets, career planning and job readiness. After participants graduate, Digital Works provides them with long-term mentorship and support as they move forward and face the unique challenges of the nontraditional workplace. Digital Works partners with more than 70 employers across the country to understand what skill sets they need from new employees. is enables staff to tailor training to jobs that employers need to fill, grow relationships with employers and build a reputation for providing important training that's not being done elsewhere. FUNDING FOR TRAINING e overall cost of training workers to fill these jobs is much less than the cost of traditional job creation, and workers are often in the local workforce, contributing to the tax base, within six to eight weeks after beginning classes. at's why cities are increasingly willing to fund such training. In most cases, cities are the only realistic sources of funding, though they can sometimes supplement the costs with foundation grants. Employers will pay for specialized, advanced training but not for training in basic online skills. And alternative workforce training programs don't fit neatly into categories eligible to access other educational and job training funding streams. Tammy Spring, who works in Columbus, Ohio, trains and supports others who lead Digital Works classes across the country, from Michigan to New Mexico. She says, "e hardship is knowing that we have something that is good and effective, but we can't offer it in a community unless there is funding. If communities fund our program and follow its guidelines, then the number of people this can help is incredible. e training can be used to provide supplemental income if someone has a short-term need, such as medical bills, or it can lead to a full-time job. ere are so many opportunities for economic growth when communities embrace and fund it properly." "If we create just five to six jobs a month, that's more than 70 jobs yearly, at about $4,000 per placement," Johnson said. "But with each new student committed to the program, the cost per placement goes down. In addition, many communities find other ways to offset the cost." Newaygo, Michigan, is a great example. e small town had a facility in the downtown area that was internet- ready and mostly unused, and it donated this toward a training program. 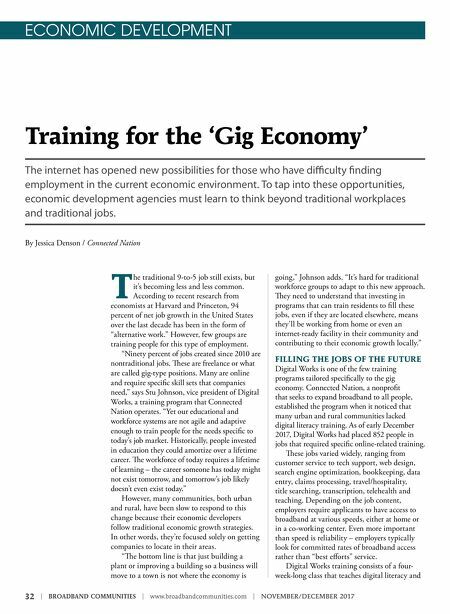 "e classes there are supported by curriculum and training provided by Digital Works, but the trainer's salary and the facility's rent and maintenance are handled directly by Newaygo," Johnson explains. "It gives the students a place to attend the classes, a place to apply for jobs and even a place to work online, once they are employed." LOOKING FORWARD TO 2018 Program staff are working on developing one-week, intensive training boot camps in Ohio. ey are also looking at new ways to serve overlooked segments of the population, such as those who have been incarcerated and would have better chances of getting jobs if they could work online. Another such group is military spouses who may have to move without warning and need jobs they can perform from anywhere. Single parents, veterans and active military, individuals with differing abilities or mobility challenges, retirees who want or need to contribute to the workforce again, and people who are simply facing temporary financial struggles all have special requirements and could benefit from online training. "We have a 100 percent placement rate with those who stick to the program. Some positions are easier to fill than others, but our staff will not quit until a graduate is placed," Johnson says. "We know that employers need skilled workers but can't find them, and there are people who need a job but can't find them. We bridge that gap." v Jessica Denson is the communications manager for Connected Nation. Reach her at 502-341-2024 or jdenson@ connectednation.org to learn how to tap into the potential of the growing online and gig market. Tammy Spring and Stu Johnson congratulate a Digital Works student completing his training in Columbus, Ohio.